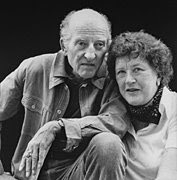 Many would think that Julia Child's love affair with fine French cuisine was the overwhelming passion of her life. They would be mistaken to think her real life loves weren't as all consuming. Julia, you see, had a lot of love and support on the home front. Julia was a woman that things came to late in life. She found love and married late at 36, an age that in 1946 made you an old maid. She went back to school in her forties, and became a TV personality at a time when her peers were considering retiring. Some might be mistaken to think that her love affair with food eclipsed her personal life. But they would be wrong. Paul, Julia's husband supported and encouraged her, and was probably the main reason she bloomed so bright in the second half of her life. He encouraged her when she decided to become one of the few women to enter Le Cordon Bleu, France's famous culinary school. He embolden her to write her opus, Mastering the Art of French Cooking. He stood beside his famous wife when her TV show made her a celebrity. He loved and encouraged her until his death at age 92. Sometimes in our instant gratification, super sexed-up, reality TV world , that kind of soft persistent, unflagging love; the kind that quietly weathers storms of taste, age, and weight; gets forgotten. People lose sight of it between workout classes and fixing school lunches. But it doesn't devalue this type of serene love, it just means we need to be more open to realizing it when we have it. And for a little fun here is the trailer from Julie and Julia. Or read her biography, My Life in France. Posted by Heidi Schempp Fournier at 1:15 p.m. Thanks for this Heidi, you must of been thinking about us on our anniversary. Yeah I know it was just a coincidence, but cool anyway.